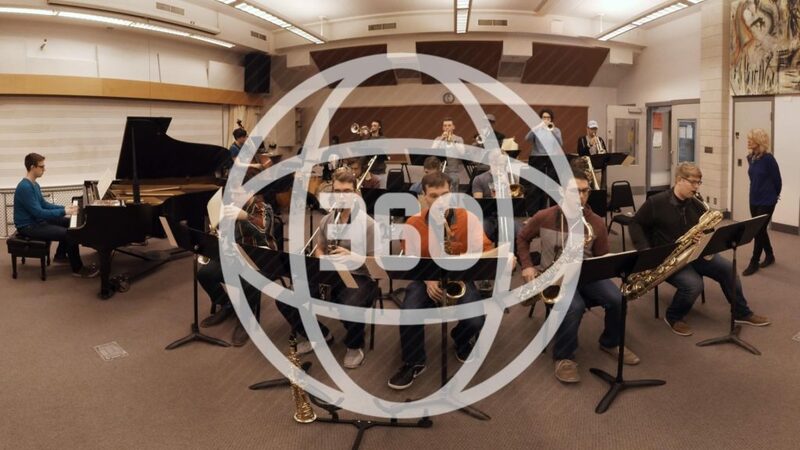 Click above to see video of the Lawrence University Jazz Ensemble. It’s back-to-back wins for the Lawrence University Jazz Ensemble. The ensemble has been named the winner in the undergraduate Large Jazz Ensemble category in Downbeat magazine’s 42nd annual Student Music Awards (SMAs) competition, which awards some of the highest honors in jazz education each spring. The honor was announced Tuesday and appears in the newly published June edition of DownBeat magazine. This is the second consecutive year that Lawrence has won the top honor in the large ensemble category, and the fifth time in the ensemble’s history that it has been honored by DownBeat. This is not small stuff. DownBeat’s SMAs are top-tier honors in the world of jazz education. They are presented in 13 categories in five separate divisions: junior high, high school, performing high school, undergraduate college and graduate college. Lawrence has been a major player in those awards over the past four decades. 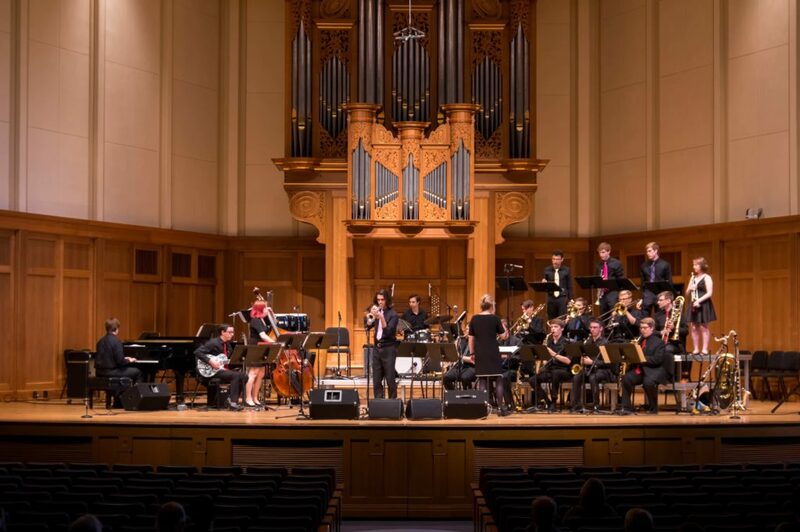 To date, students and ensembles in the Lawrence Conservatory have won 28 of these awards in various categories, including undergraduate large ensemble, small group, jazz composing, jazz arranging, solo performance, and jazz vocal group. This was the fifth time in its history the Jazz Ensemble has been honored by DownBeat. It was previously recognized in 1985, 2000, 2007 and 2018. Back-to-back wins for the Jazz Ensemble is something the school, its faculty and students can take great pride in, Darling said. If you want to see the LUJE in concert, you can catch them at 8 p.m. May 22 at Memorial Chapel. Admission is free. The DownBeat Student Music Awards were launched in 1978. Judging criteria are based on musicianship, creativity, improvisation, technique, sound quality and balance, excitement, and authority. Recordings are submitted from institutions worldwide and are judged by panels of respected jazz performers and educators who determine the awards in each of the categories. The Lawrence University Jazz Series will continue on February 17 with NEA Jazz Master and saxophonist Benny Golson. Joining Golson on stage will be the Lawrence University Jazz Ensemble (LUJE) and the Lawrence Jazz Trio. The concert, which takes place at 8:00 p.m., will be held at Lawrence Memorial Chapel. Tickets for this concert are available at the Lawrence University Box Office, 920-832-6749, and range from $15 for students to $22 for adults. Golson comes to Lawrence University through the National Endowment for the Arts (NEA) Jazz Masters On Tour program, organized by the NEA and Arts Midwest and supported by Verizon. A composer, arranger, lyricist, producer and tenor saxophonist of world renown, Golson has contributed his distinctive saxophone style to ensembles led by such jazz greats as Benny Goodman, Dizzy Gillespie, Lionel Hampton, Earl Bostic and Art Blakey. For more than five decades Golson has made major offerings to the world of jazz by composing standards such as “Killer Joe,” “Along Came Betty,” “Five Spot After Dark” and “I Remember Clifford,” along with compositions and arrangements for musicians such as Count Basie, John Coltrane, Miles Davis and Ella Fitzgerald. He has given hundreds of performances in the United States, Europe, South America, Far East and Japan. In 1996, Golson was named an NEA Jazz Master. Established in 1982, the NEA Jazz Masters program honors living legends for their exceptional contributions to jazz and helps to connect them, and their music, to the American people through broadcasts, publications, educational initiatives and NEA Jazz Masters On Tour. The NEA Jazz Masters Initiative is sponsored by Verizon with additional support provided by the Doris Duke Charitable Foundation through a grant to Chamber Music America. Most recently, Golson appeared as himself in Steven Spielberg’s film, “The Terminal” and recorded his new CD “Terminal 1,” which was released in June 2004, with Concord Records. He is currently putting the finishing touches on two books, a major college textbook and his autobiography. For additional information on this and other “Performing Arts at Lawrence” series concerts, please visit www.lawrence.edu/news/performingartsseries.